Being blind as a bat, I’m always on the lookout for attractive eyewear. Especially now, considering I haven’t replaced the glasses I’ve had since freshman year in college (I mean they are Versace, but they need to be exchanged ASAP)! 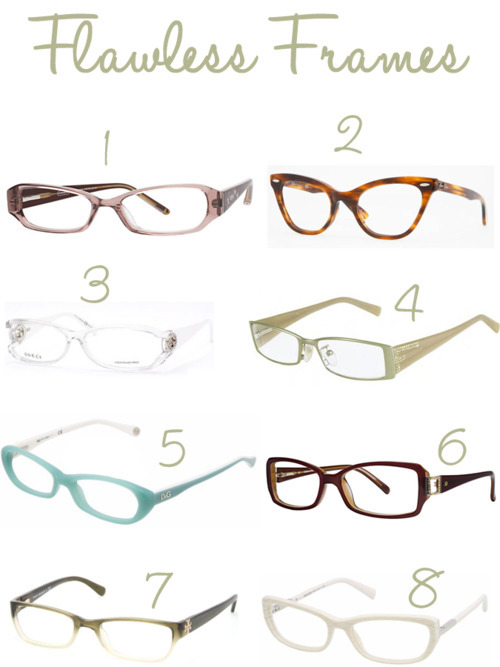 I’ve scoured the web for some special specs – hope you other blind babes out there enjoy it! 2. Ray Ban RX RX5226 Eyeglasses in Havana – $164.88 | stylish frames with a major cat-eye to go with the huge trend right now! 3. Gucci 3010 Eyeglasses in Crystal White – $325 | clear frames are always good-looking on fair skin and against light hair, so these are ideal for me and other real blondes out there! 5. D&G DD192 Eyeglasses in color 1704 – $119 | great splash of color on these feminine specs, feeling summery? grab a pair! 8. Prada PR 03NV Eyeglasses in Ivory Trap – $176.80 | my favorites, these beautiful ivory glasses are simple, trendy and not too expensive.